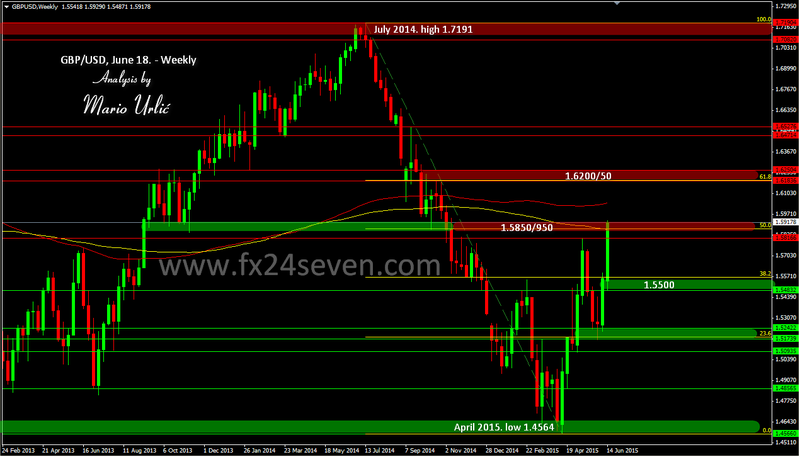 GBP/USD, only sky is the limit! The Pound has returned 50% loss of the huge July 2014. > April 2015. fall, with high of 1.5929 for now. Even the pair was near this level before 5 weeks, 1.5800 was to much then and US dollar bulls has retuned the pair down to 23.6 fibo at 1.5170, to the level which has supported the British currency in the previous two weeks. In this week, the pair started and was supported at 1.5480/500, after wich it’s rising 4-th day in a row. What now? 1.5850/950 could be weekly resistance, there is wekkly MA200 at 1.5876, but on the other side, if Pound close this week above 50%, that level could become a preaty strong support for the pair. Great week for the bulls here, let’s see how and were will ended tomorow!? If there is enough strengt for the bulls to hold the pair here until? Very nice development in the past two weeks for them.